An easy method to garden without having to break your back digging up or tilling the soil in your garden is the Lasagna gardening method. Also known as layered gardening, sheet composting, sheet mulching, no-dig gardening, the Lasagna gardening method was popularized in the 1990’s through Patricia Lanza’s book ‘Lasagna Gardening’ (What did you think it would be called?)! Lasagna gardening involves building up the soil by adding alternate layers of carbon-rich and nitrogen-rich organic layers that over the course of time is broken down by beneficial microbes, insects and earthworms to give rich, fluffy soil that will make your plants thrive! Doesn’t that sound great? You don’t have to double dig or till the soil in your garden. You don’t have to remove existing weeds and grass. In fact, you don’t really have to bend your back and do anything to the soil! This is how it could look once you’re done. If you’re extremely neat, that is! The concept of Lasagna gardening actually mimics nature’s way of enriching the soil! Think of a field where grass and random plants grow. In the course of a season, a time comes when the plants dry out and decay and are covered by falling leaves. Animal manure and fruits lay sprawled over the ground. These can be classified into separate layers on the ground and when rain comes pouring, an ideal environment is achieved and enriched soil is formed. In Lasagna gardening you get to manipulate the soil you create by choosing to add various combinations of layers. Building a Lasagna garden is very much similar to building a compost pile. Like a good compost pile, your Lasagna bed should contain a healthy mix of various types of organic matter. 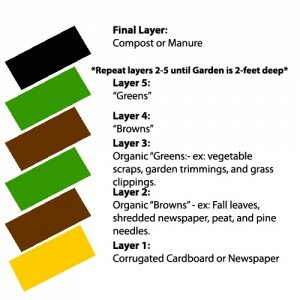 A rule of thumb that every gardener should know while creating the various layers is that the carbon-rich (“browns”) layer be at least twice as deep as the nitrogen-rich (“greens”) layer. Browns are dry dead stuff including dry leaves, straw, hay, shredded newspaper, peat, pine needles and small twigs and wood chips. Greens are grass and garden clippings, kitchen compost, leftover fruits and vegetables, egg shells and manure from herbivores. Using animal meats or any type of fats is a strict no. You don’t want maggots in your soil! Fall is the ideal time though, since the amount of organic material available for free is aplenty! Then as you let it sit through the winter, by the time spring arrives you will have rich and fertile soil waiting to be used. If you want to start a Lasagna garden during spring or summer, the only tweak you would have to make is adding more “soil-like” layers to the bed like top-soil or peat. This is because there isn’t enough time for the microbes to work on your layers before you can plant! Plan your crops and select a spot: As with any garden, planning what you want to grow in advance is essential. Do some research and get advice from fellow gardeners to find out what vegetables do well in your area. Take into account amount of sunlight, irrigation, pest problems etc. while deciding the space. Assemble your Lasagna plot: Creating a Lasagna garden is a lot like dinner-time lasagna! Yup, you get to customize the ingredients to match your taste. Now that you know what you can layer with, here’s how to assemble your plot. 1. Build the foundation: Lay down on your planned area 6 to 10 sheets of newspaper or 1 sheet of corrugated cardboard so that the entire grow area is covered. This thick under-layer should overlap at all the edges. Before proceeding soak this entire area thoroughly. Water helps keep the layer intact and sets the premises for earthworms and their likes. Do not use fully colored or glossy newspapers. This layer essentially blocks weeds and other unwanted plants from growing in the area. 2. Alternate following layers with nitrogen-rich and carbon-rich material: Here’s the best part! You get to fill the layers up just the way you like it! Just keep in mind the rule of twice as much carbon-rich as nitrogen-rich material! Say you add a nitrogen-rich layer of manure about 2 inches deep. Add then, 4-6 inches of carbon-rich dry leaves etc. Chopping and shredding leaves, twigs and newspapers you add help a great deal cooking them up faster! While adding layers, do not compress them. Aerated layers do better during the decomposition phase. Pictorial representation of layers involved in a Lasagna garden. Keep adding alternating layers till about 1or 2 feet or as you please! 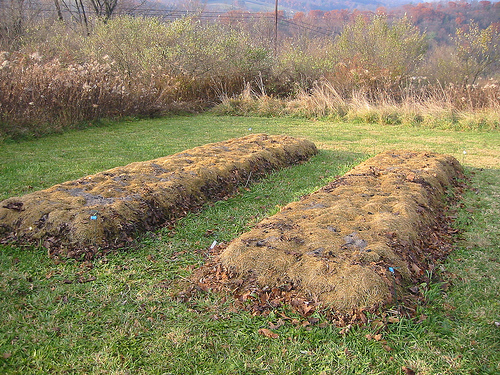 The mound will eventually shrink down over the course of months owing to decomposition of the layers by organisms so don’t worry about the pile being too high. You can top it off with some top-soil or humus to provide a more soil like amendment. Some gardeners add pure compost and soil on top so that the mixture will have some sand, clay and minerals in addition to organic matter. You can add other minerals and nutrients to the bed at any point. Bone meal or fish bone meal adds phosphorous and calcium. Greensand or kelp meal add potash and trace minerals, rock dust adds trace minerals too. 3. Let it cook: Once you’re done with the layers, keep them moist as organisms thrive in such conditions. Covering the bed with a sheet of plastic weighed down on the sides helps not only in heating up and quickening the process but also in keeping out animals that could burrow through the bed and mess it up. Each material in the bed has its own decomposition time. Hence the bed is best when all of it is decomposed. 4. Plant away: If you’ve used cardboards at the bottom, use a shovel to cut through it in many places so that roots can go through them. No need of digging. Just pull the soil apart, plant and cover up with soil. People have put in plants right away in their Lasagna gardens and have been satisfied with the results. Waiting for months though will give you much better crops as the soil will be nice and rich! Maintaining your Lasagna bed: Maintenance is pretty simple! Just add mulch (grass clippings, bark, and leaves, straw) to the top of the bed every now and then. Weed and water as necessary. That’s it! Enjoy your harvest! Need seeds or starter plants? Check our online store!